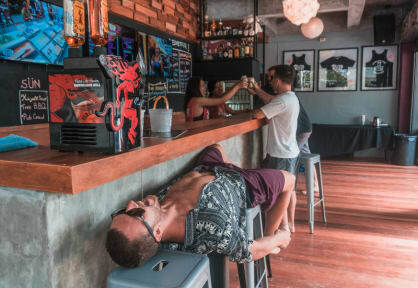 Slumber Party Hostel i Krabi, Thailand : Boka nu! Had such a great time at slumber party. They got me very drunk and hosted very good parties. The booze cruise and the pub crawl was so much fun!! Love the staff, especially Shauna and Hugo, they are f***g party animals!! Recommend!! Had a really good time on the hostel when i wasnt hungover som big thumbs upp to the staff!! Little extra to hailey and hugo! Second time I’ve stayed and it keeps getting better and better. I LOVE slumber party. The staff, party, atmosphere and dorms are awesome. The staff really make sure you feel welcomed so it’s super easy to meet others as a solo traveler. I would recommend everyone to do the day tours, perfect way to get to know everyone and then you party together at night! Pub crawl and beer pong are waiting for you! Shout out to Teejay, you’re the best! I really ebjoyed Slumber party and I can really recomend this hostel! Soo damn good! Had a great time staying here! This is truly the best place to stay if you like to party and meet new friends! We had a great stay here! Nice dorms, great activites and tours. The pubcrawl was so much fun and we also did the Island tour with Jireel who was such a nice guy. The staff is great and really helpful so highly recommend this hostel.